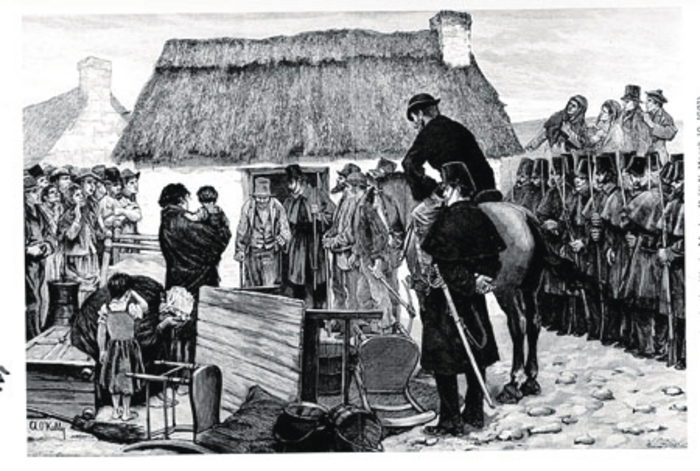 Complete change of approach, ‘An eviction in the west of Ireland’ (By Aloysius O’ Kelly) published in ILN March 19 1881. The despair of the weeping mother, the furniture thrown outside, the soldiers helping the bailiff do his work, the anxious crowd watching. The quality of O’Kelly’s work is obvious. The Great Famine coincided with the founding in 1842 of the world’s first illustrated newspaper/magazine, The Illustrated London News (ILN ), closely followed by the Pictorial Times. The first edition of the ILN sold an encouraging 26,000 copies. Within weeks it was selling 60,000 copies, and this rose to 100,000 by the peak of the Famine. The author and historian Niamh O’Sullivan** tells us that for every purchaser there were an average 30 readers, so a significant proportion of the British public learned about the terrible events in Ireland through these magazines. Illustrations in these pre-photography days were presented by a skilful team of artists working in different mediums. Initially the artist, working in the field, drew the picture, which was sent to London where an illustrator/draftsman transferred the image on to blocks of wood, which the engraver, using delicate lines with white and dark spaces, composited the image alongside movable type in page layouts. It was a startling and revolutionary idea, and presented readers with something very different. The engraved pictures had an immediacy, and a dramatic quality never seen before. Such graphics electrified crime stories, brought to life many of the characters in novels and children’s stories; but also presented British readers with views from around the Empire which were not always glorious. Editors quickly learned the importance of good pictorial journalism to grab readers’ attention. It was a golden age of illustration. Charles Dickens, Lewis Carroll, and others, immediately saw how they could enhance their stories with an appropriate picture, now forever in our minds as we read them. Dickens was fortunate to work with the best including George Cruikshank, and the wonderfully named Hablot Knight Browne, who drew under the name Phiz. Many of us are familiar with the stock in trade pictures and drawings we have of the Great Famine. They are used constantly in virtually every book on the subject to such an extent that we see them as rather timid representations of that historic tragedy which was one of the first global calamities to feature in popular illustration. But Ms O’Sullivan argues that these engravings are worth closer scrutiny, as initially newspapers avoided reports that were critical of the British government’s handling of the catastrophe. The impact of the stark pictures soon convinced the reading public that a major tragedy was unfolding in Ireland. The illustrations further revealed that conditions of the poor were worse than any part of the British Isles. Readers now could see it for themselves. These same images, which because of their familiarity I had thought unshockable, had woken up Britain to the scandal of mismanagement that was destroying a nation. They had a direct bearing on the gradual change of policies, some of which eventually changed the entire land-owning landscape of Ireland. Perhaps the most famous artist to work for the ILN was Aloysius O’Kelly, who trained in Paris, and whose best known painting Mass in a Connemara Cottage was exhibited at the prestigious 1884 Paris Salon. Previously he was sent to the west of Ireland by ILN to draw events there. His drawings, and subsequent engravings, have an obvious quality that is superior to many others; but looked at again I can see the gradual change in the subjects chosen by all the artists reporting from Ireland. From depicting straight forward portraits, and scenic views among pictures of a ‘wise and humane government’ doing their utmost for a ‘destitute and famine-stricken population’, and the ‘lawless ruffians who prefer the wages of crime to the fruits of honest industry’, to becoming torch-bearers of the truth to the nightmare that was unfolding in front of their eyes. NOTES. * Eighty-five per cent of the population lived on small plots of land in extreme poverty (Population of Ireland at the time of the Great Famine was a staggering 8.7 million ). Despite Ireland being a net exporter of food at the time, there was no connection between the exportation of food, and the starving people desperate for help at home. Land ownership was also a major factor. Estate land was held in freehold or outright ownership by the landlord, and then rented or leased in small or large parcels to tenants. Nor were all landlords from the ‘Big House’ variety. Many tenants were also landlords, subletting to smaller landholders.